Today was the first day of the much-anticipated dig. Setting off this morning with my waterproofs, walking boots and rucksack I felt as though I was about to tackle Snowdonia. I probably did allow for too many worst case scenarios judging by the weight of my rucksack. The site itself is extremely remote. The ground is boggy and bumpy, and we were sharing it with some curious cows. They must have seriously ruminated about the motley group of bipeds digging up their grass today. (Not to mention the yellow quadruped with a wagging tail who liked the taste of their dung). Yes, Trudy came too. The plan today was to dig four trenches so that we have an idea where to focus our efforts for the next two weeks. As we set to work the air became damp with impending rain. Thankfully one violent shower was all that fell from the sky. Because we are excavating a field that is normally used for grazing cattle, we have to pile up the soil in separate mounds so that afterwards we can put it all back in the right order (known as backfilling). The topsoil is the first layer of soil, and this was hard and crunchy as the spades kept hitting tree roots. 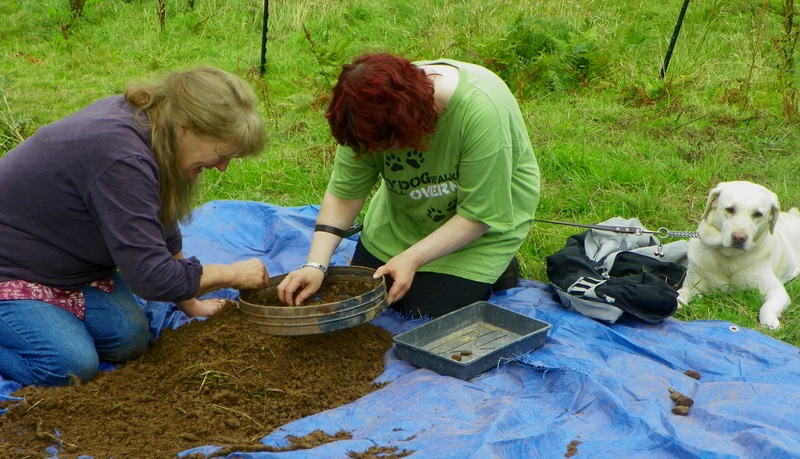 Some people dug the soil, while others (like me) began sieving the mounds of earth to sort out any hidden finds. It was a lovely moment when one of the volunteers found his first large piece of pottery. We all found various fragments of pottery and glass. The general rule of thumb for novice archaeologists is: “If you’re not sure, put it in the Finds Tray”. At first most of my “finds” were stones and gravel, but as my fingers became more tuned in to the soil I was able to hand-sift tiny fragments of glass and pottery, and to differentiate between stone and brick. As the trench became deeper, the soil lost its lumpiness and became more fine and dry. By the end of the day I had even stopped yelping at the sensation of worms and centipedes wriggling through my fingers. Today has been such a memorable day. I enjoyed the competitiveness between the different trench teams, the camaraderie during the lunch break as we sheltered under a gazebo, the sonorous cows, and the field itself with its old oak trees peacefully watching. But like all the volunteers I am absolutely exhausted! Walking back from the site at the end of the day I could hardly muster up enough power to motor my arms and legs. At one point I actually forgot how to walk. We left the seasoned archaeologists on site digging deeper into the trenches. Which one will be our focus for the project, and will we discover anything significant about Studmarsh? 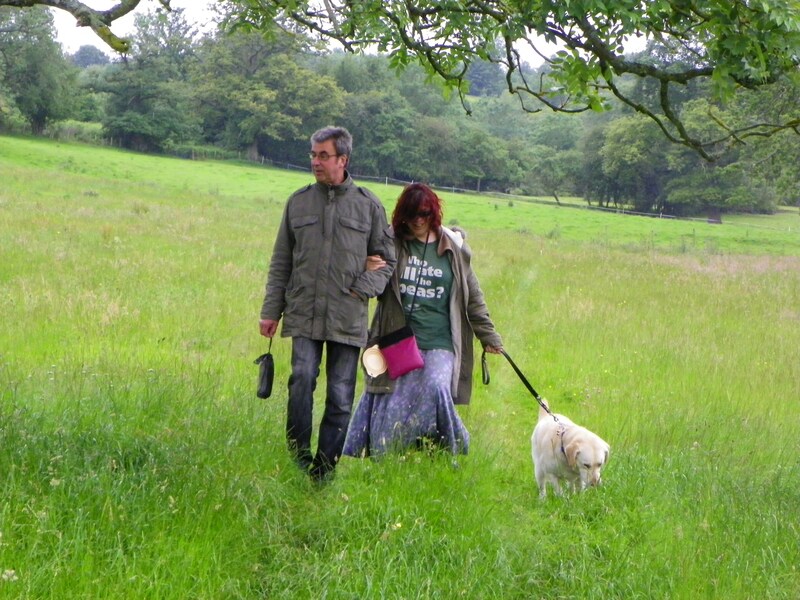 Past in Mind is a Heritage Lottery ‘Your Heritage’ funded project run by the mental health charity Herefordshire Mind, and is an innovative heritage, community learning and mental health support project. 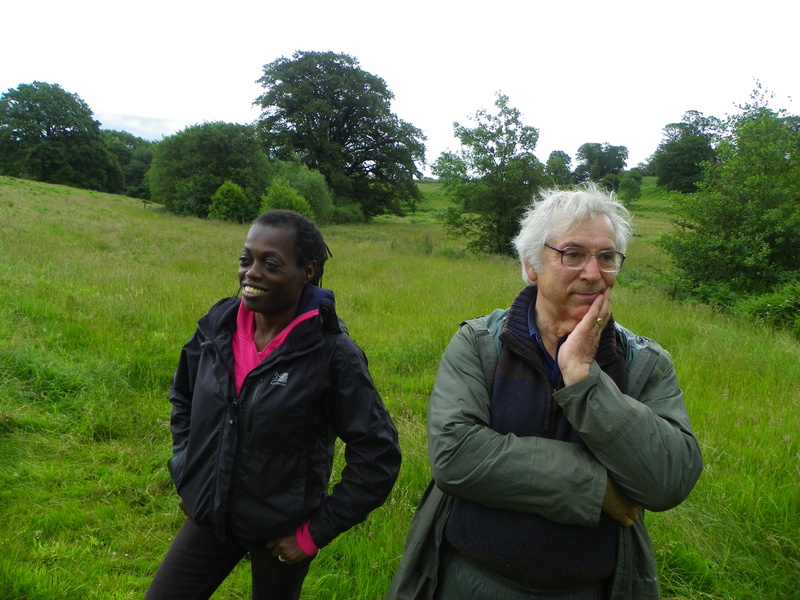 It is running from June 2012 to June 2013, and is undertaking an exciting new historical and archaeological investigation of the lost settlement at the Studmarsh/Grove (located on the National Trust’s Brockhampton Estate, Herefordshire). The project is being undertaken by volunteers including people recovering from mental health problems. With professional support and training, volunteer opportunities will include historical research, archaeological survey and ‘digging’, finds and results analysis and the development of displays and other information resources. The Studmarsh/Grove site today consists of enigmatic patterns of ‘humps and bumps’ spread across a grazed field. Although the site – first recognised on aerial photographs in the 1970s – would generally be described as a ‘DesertedMedievalVillage’ (or ‘DMV’ for short) the truth is we don’t know what is really represented by these remains. Questions such as what the settlement looked like, when and how it began, how big it is, what life was like there, how it changed through the centuries, why it declined, and how it relates to the origins of local life today, all remain to be answered. These questions are particularly interesting because the Studmarsh/Grove is just one of hundreds of similar sites across Herefordshire and the West Midlands. This vast lost story of rural life stretching back over hundreds of years has been little investigated, and the Studmarsh/Grove investigation will also shed important new light on the archaeological potential and importance of many similar sites. The aim of the excavation is dig into some of the platforms, ditches, banks and other features which make up the site (which we previously mapped during the survey work in July), and to try and find out what lies beneath these features. Although archaeology often produces the unexpected, we are fairly confident we will find building remains, and finds such as old pottery. We hope this information will link with the ongoing historical research to reveal something both of the lost story of Studmarsh/The Grove through time, and allow a direct glimpse of the lives of the people who once lived there. 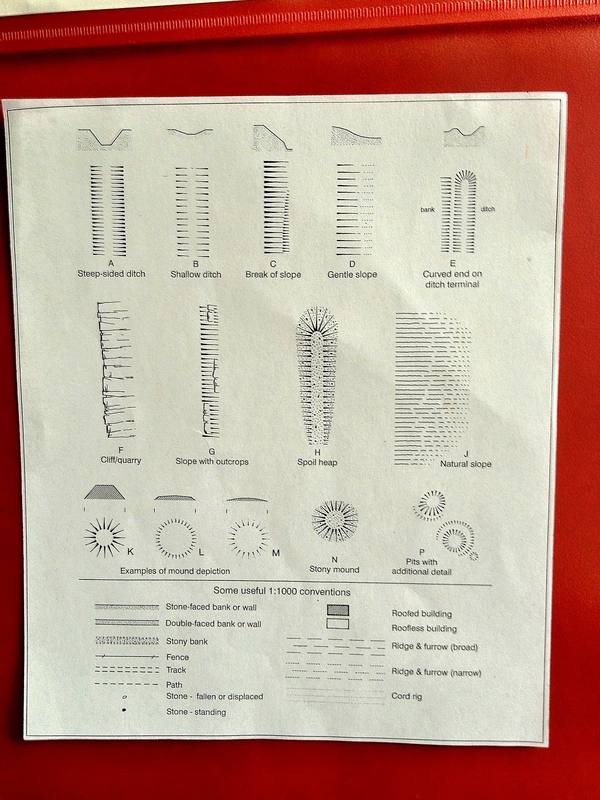 However, excavation does not produce instant answers, and the real objective of the two week digging project is to produce a detailed record of everything we find supported by plans, drawings and photographs. At the next ‘post excavation’ stage all this information will then be subject to further analysis to being to understand what we have really found. We will be begin by digging a series of small square test pits across the site to establish the nature of the archaeological remains in different places, and the potential for further excavation. We will then expand two of those text pit excavations into larger trenches to more fully explore the remains in those areas. These larger excavations will involve careful investigation of the buried layers and features such as stone walls, pits, postholes etc which we may find. Although there will be a degree of physical work in all of this – removing turf, using tools such as mattocks, spades, wheelbarrows and trowels to gradually uncover buried features – there is much more to excavation than that. Producing section drawings and plans at each stage of the process, keeping written records, cleaning and recording finds, and taking photographs are all essential parts of the process, so there will be plenty to get involved with, and you don’t need to be an Olympic endurance athlete to take part! 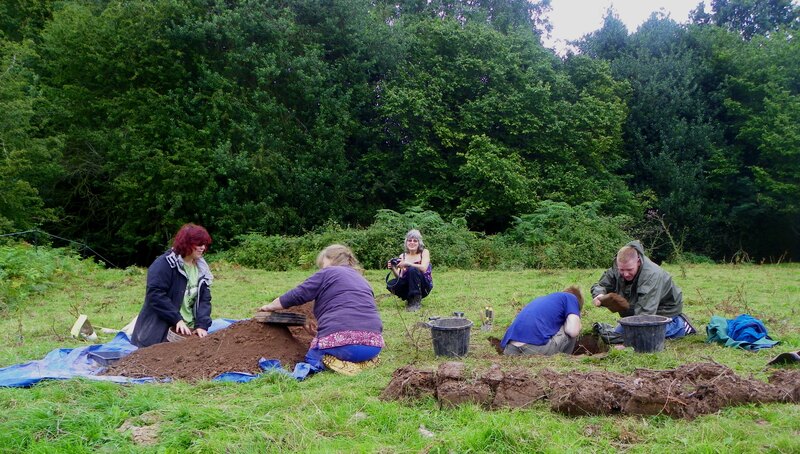 Dai Williams and Chris Atkinson from Herefordshire Archaeology will be on hand to give all the necessary support and training, and no prior experience is required. 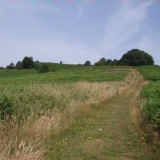 Working with the National Trust, we are very keen that the results of the work are made publicly available. The excavation will therefore be open for public visits over the August Bank Holiday Monday (August 27th) and Tuesday August 26th. The visit process is being coordinated with the help of the National Trust, and will include the option for visitors to join morning and afternoon guided tours or to drop into the site as and when during those days. We very much hope that at least some of the volunteer team who have been involved in the excavation project will be available on those days to help explain the discoveries we have made to the visitors, and this is another opportunity to get involved in the project. The final stage of the excavation is to restore the holes we have dug. This is important because we have only been given permission to dig via the National Trust and the farmer on strict condition that we properly reinstate the excavated areas. Moreover, it is crucial for the long term future of the remaining archaeological deposits that the ground is maintained in good condition. Essentially backfilling will involve replacing the soil we have removed back into the excavation trenches, ensuring that the ground profile of the ‘humps and bumps’ we have dug into is restored during this process, and then that the turf is carefully replaced so that the grass will rapidly re-grow and recover. The aim is to make sure the site will soon look as if we had never been there. Obviously, the ground restoration will involve physical work and might not sound terribly glamorous. However, it is an important part of the project, and we would very much welcome volunteer help with this final stage of the excavation. After spending much of the previous night indulging in the Olympics Opening Ceremony, I was not feeling my shiniest on Saturday July 28th. But by the time I was sitting on the bus chugging off to Bromyard my “left over night” feeling had disappeared. I like the spirited journeys out to Bromyard and Brockhampton, and this one did not disappoint. 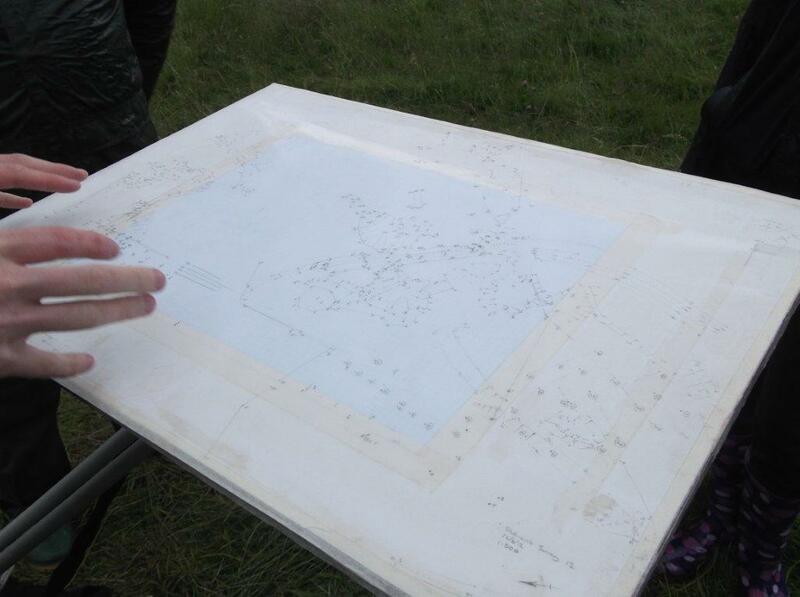 The purpose of the day was to give an overview of what we have learned so far about the Studmarsh site. We also had to decide where to dig the archaeological trenches. 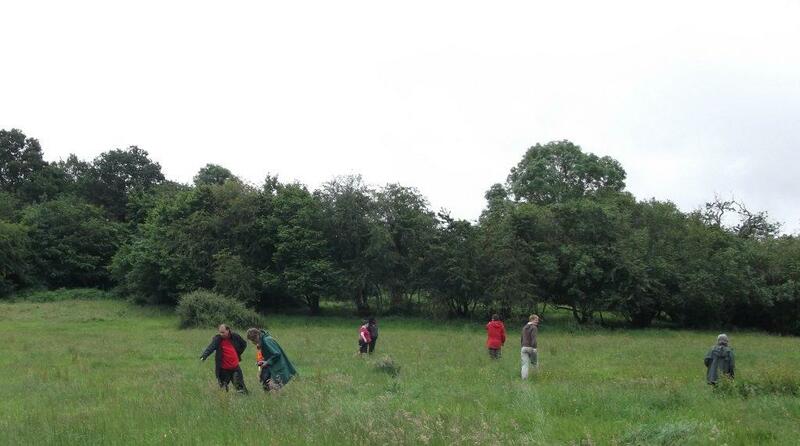 The Studmarsh site has many “humps and bumps” beneath its long grass, so we need to target the dig carefully given the fact that we only have two weeks to complete it. 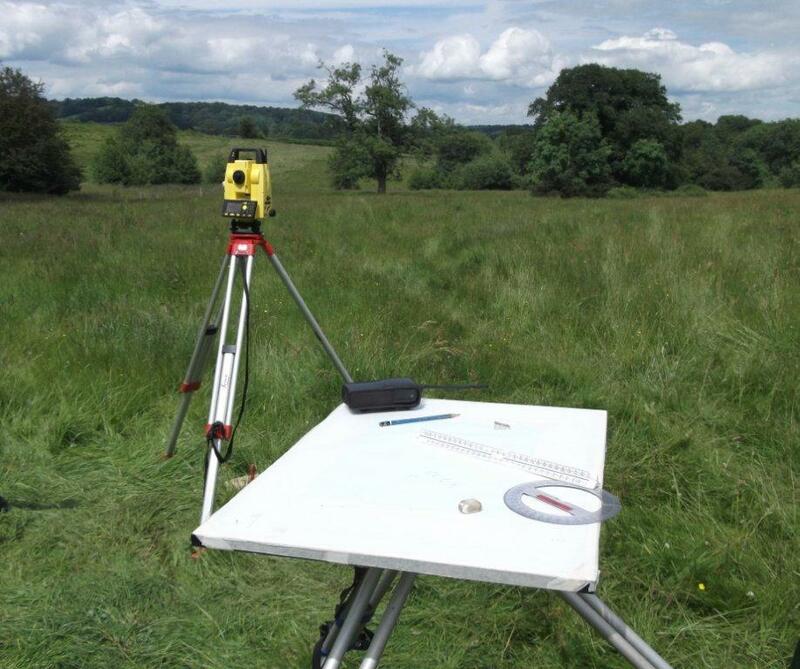 This impressive piece of kit gives incredibly accurate (within 2m) measurements of land surface from an aerial view, so in an area like Studmarsh where the grass is long and there are many uneven areas of ground, the humps and bumps can be properly mapped out. Historian Kate Lack gave a detailed overview of the relevant finds from our historical research groups. Please refer to the History Page for Kate’s written update, including extracts from the “Tabloid” headlines associated with Cradley Parish in 1397! (Not for the prudish). When I translated the Latin from the Visitation records for Cradley I was struck by the scene of desolation and desperation reaped by the Black Death. Beneath the salacious headlines which would embarrass most daily Red Tops, there is a sense of hellish suffering in the day-to-day lives of local inhabitants. One of the strands of the Past in Mind project is to explore mental health within the framework of archaeology and history. Many volunteers in the group, including myself, experience or have experienced times of mental distress. Although this is not the focus of the project, it is important that we acknowledge it. With this in mind I was asked to begin a general discussion about the project and how volunteers are finding it in relation to their every day lives. What follows is a snapshot of Past in Mind volunteers glimpsed through some individual responses. Mark: “It’s given me the confidence to open up and talk in front of others about mental health”. Chris said that the project has opened things up for him which he has not tried before, such as studying history. Although his father has always been keen on metal detecting, the Past in Mind project is a new experience for him. Chris feels enabled to do more things on his own since becoming a volunteer. Mark said that it is good to be with others again and he is glad there are some service users he knows among the volunteers. Mark mentioned the leaning castle of Bridge North which once featured on Time Team, one of his favourite TV programmes. 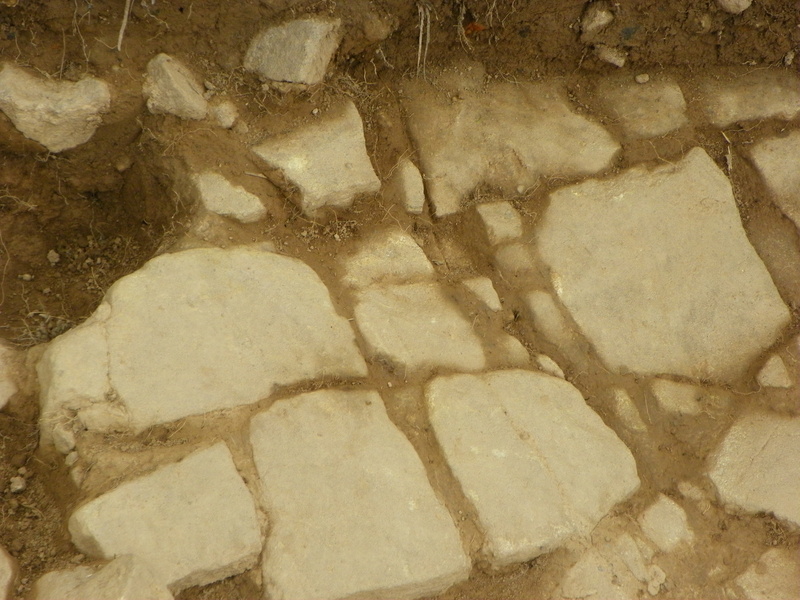 Ian commented that it was surprising how little had been found during the Bridge North excavation despite the famous “leaning castle”. 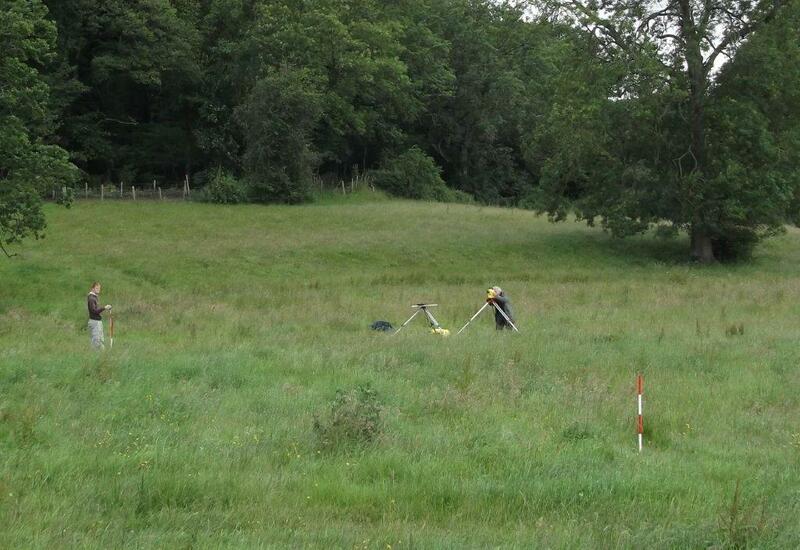 Helen admitted she feels a bit worn out, but she really enjoyed the Site Survey in June/July – particularly the hands-on use of archaeological equipment such as the Prism and Total Station. Jenny said that when she began this project she didn’t know much about history or archaeology and she has enjoyed exploring new ideas. Kate stated that all the volunteers are on the same level no matter what their level of expertise, as we do not know what we might discover in relation to the Studmarsh site. She enjoys channelling the group to try to find answers. 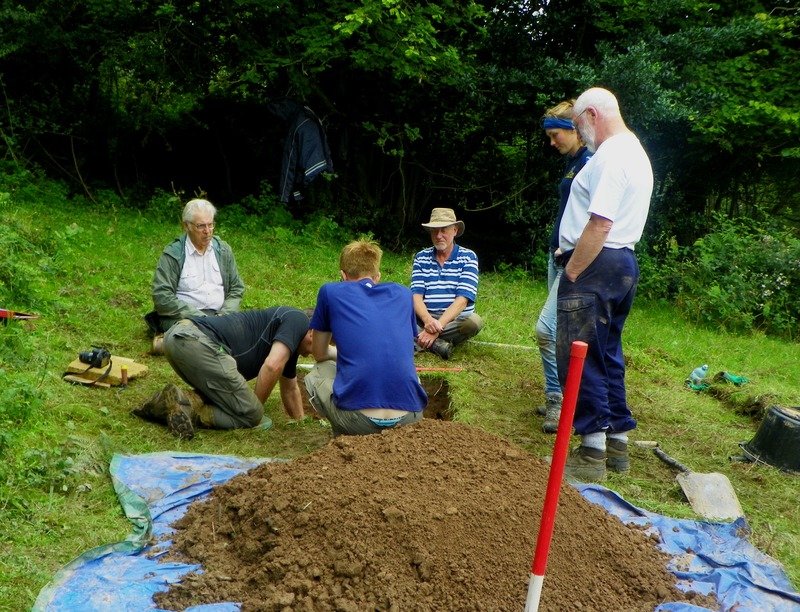 Helen likened the project to the TV programme “Deal or no Deal”, explaining that when we dig the archaeological trenches in August we do not know which trench, if any, will yield something valuable. Mel said that she has found the project double-edged. She has had to confront some personal past experiences which have been quite emotional. It has been exhausting for her, although she has also found it a very positive thing to do. Mel said that she had not expected the project to have this effect on her. Judith sometimes finds it difficult to concentrate as her attention is often caught by interesting but irrelevant details when she is researching texts. It is easy to lose focus as there are so many details she wishes to pursue. Claire said that she too has experienced mixed emotions through being involved with this project, although it has been an exciting challenge. Mel claimed that when she first started out with this project all its strands seemed very separate and she couldn’t see the relevance of some of the earlier research. But now the content is overlapping more and the project makes sense. Today (July 28th) is the first day that it all seems to fit together. Trudy the project Labrador, moaned and grumbled throughout the discussion as she was not the topic of conversation. We talked about many other things including the role of technology and communication, but I would never finish this Blog post if I detailed everyone’s contributions! This snapshot account captures the project and its volunteers before the eagerly anticipated dig, which is scheduled to start on August 13th. Please refer to the Contacts Page if you wish to find out more or get involved. On Thursday (July 19th) we convened at the Museum and Resource centre in Friars Street, Hereford. 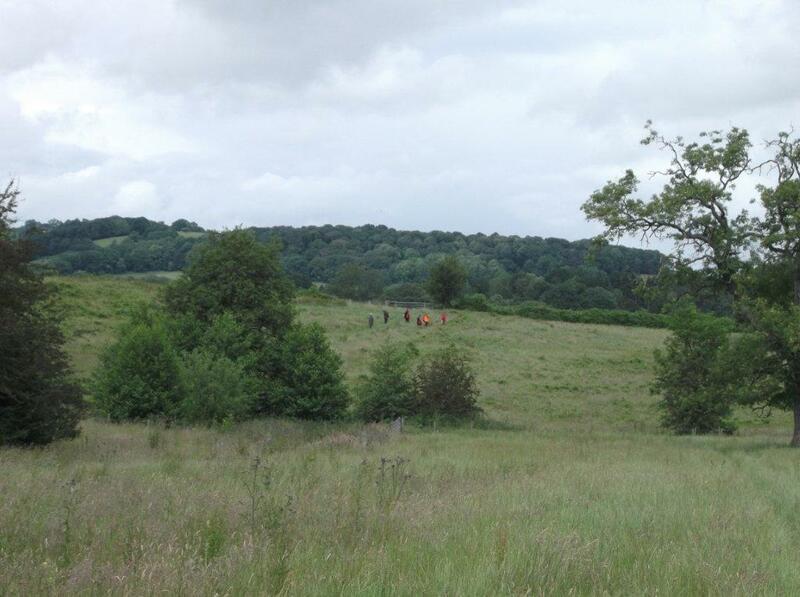 Our task was to draw up the archaeological plan of the Lower Brockhampton site survey. Everyone involved with the site survey was still talking about the rain, which the sky had tipped out almost every day for ten days. Before we set to work we were given a lightning tour of the museum stores. The entire building is temperature-controlled to preserve the artefacts, but the store-room itself is engineering genius. The containers were massive and stacked on runners which ran the length of the floor. There was every conceivable artefact including bones, manuscripts, ceramics and tools. I was drawn to a huge iron key which belonged to the old Hereford gaol, and some medieval dice that bear no resemblance to the little plastic cubes used in today’s board games. I didn’t take Trudy down the corridoor that housed all the bone archives, just in case her snout got the better of her. Having never ventured into the bowels of a museum archives store-room before, I was engrossed. Not for the first time, many people in the group were stirred by the incredible sense of history around us. Once back in our study room it was time to do some work. Chris, one of the archaeologists, displayed limitless patience throughout the day as he proceeded to teach everyone the techniques of drawing an archaeological map. I sat back and enjoyed taking in the industrious atmosphere. Collective concentration hovered over the room like a powerful orb. Trudy lay beside me eyeing up the chocolate Digestives which had found their way onto the table. 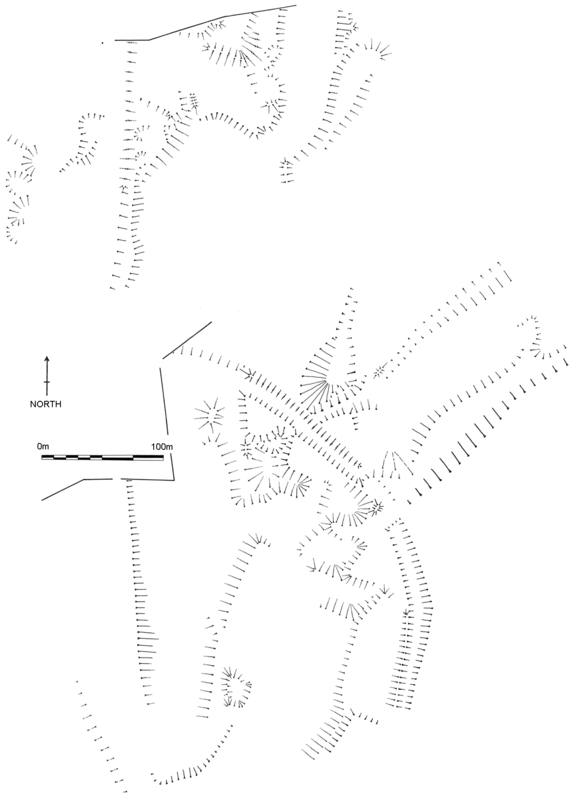 The reason why we need to draw an archaeological map is partly for our own benefit. When we start the excavation in August, this map will show the physical layout of the site and it will help to determine where to dig the trenches. But it is also greatly important for posterity. We have to produce a Master copy which will be the official document for this particular excavation, and will be permanently preserved in local records. That sense of “making history” caused great excitement and a general feeling of pride. Even those who had found drawing the practise maps a little daunting came to life when Chris displayed the Master copy and told us that everyone was going to make a contribution to this. 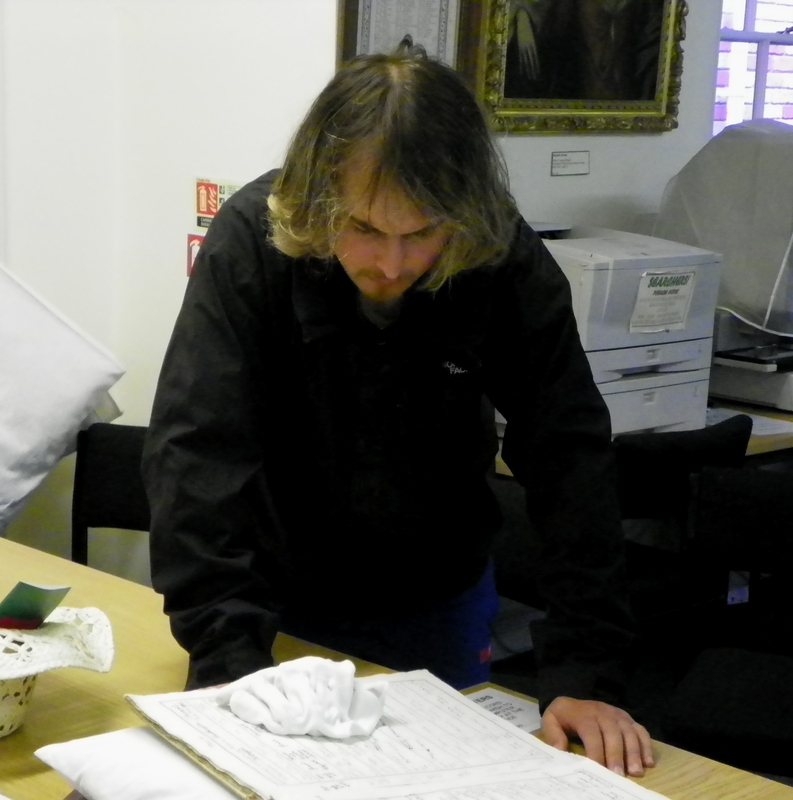 One of our long-standing project volunteers, Mark, was first to add to the Master copy map. By this point everyone was in really good spirits and there was a great deal of support for each other. Everyone in the group “made their mark” yesterday. The Master copy of the archaeological map for the Lower Brockhampton site will be a true team effort when it is completed. I know my self-esteem quadrupled and I could sense other people feeling very upbeat as they left for home at the end of the workshop. 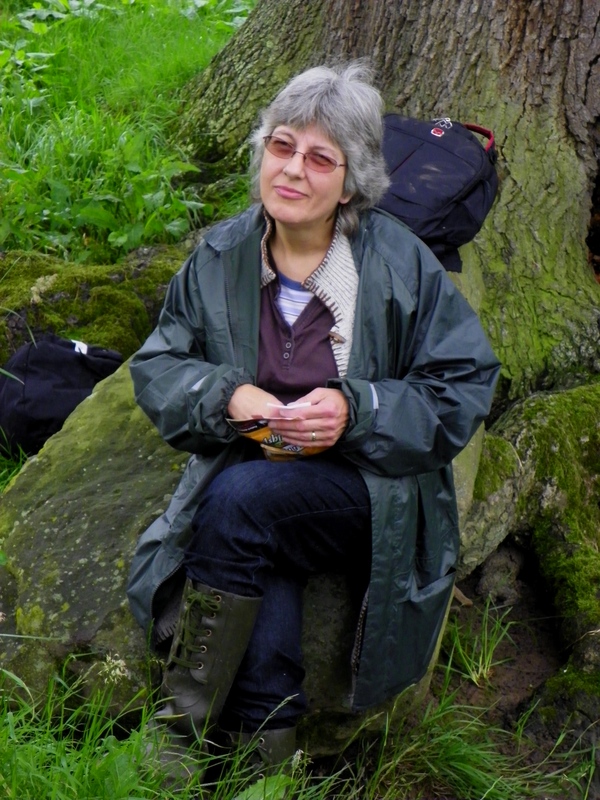 Volunteer Helen Dean gives her own account of what the Past in Mind project has to offer. Well, that was a busy 2 weeks. I have learned a lot, especially about surveying the land with the ‘total station‘ and prism (equipment to take the measurements to hopefully get our measurement right when mapping it down on paper). It’s all new and very interesting, and VERY WET. It gave me a lot thinking and pondering about what we will think or find out about Studmarsh, and whose and which guesses and ideas will be right. It has also stirred up some thoughts about my past, some thoughts I could do without and some good. After more churning my thoughts, I have generally found the past in mind project very good for me and also seen others gaining positive thinking, and smiles and jokes about it all, from us as a group. We all seem to have got the bug now, with an aim to find out what mysteries and secrets Studmarsh and the areas around might hold.